Welcome to the Ayrshire Birding web site. This page contains any local bits of news and gossip that might be of interest to birdwatchers in Ayrshire, locals and visitors. 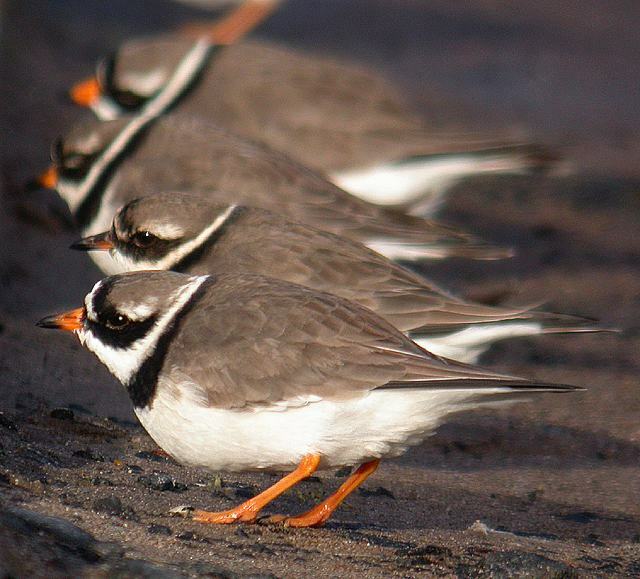 The site contains a wealth of information, articles and images on Ayrshire’s birds. To explore the site click on the various options on the menu on the top. To submit any news, point out any errors or omissions, or just pledge large amounts of cash, please contact the site maintainer. This website has existed since June 2000 (thus making it one of the oldest, continually updated local birding web-sites) to provide information of value to all with an interest in the wild birds of Ayrshire and in birding in this area, whether resident or visitor. The site is sponsored by SOC Ayrshire (the Ayrshire residents of the Scottish Ornithologists’ Club). It includes news of their activities and of other relevant organisations such as RSPB Central Ayrshire Local Group and RSPB North Ayrshire Local Group as well as being a forum for all birders in the area. As of January 2013 the site’s pages have been viewed over a million times. 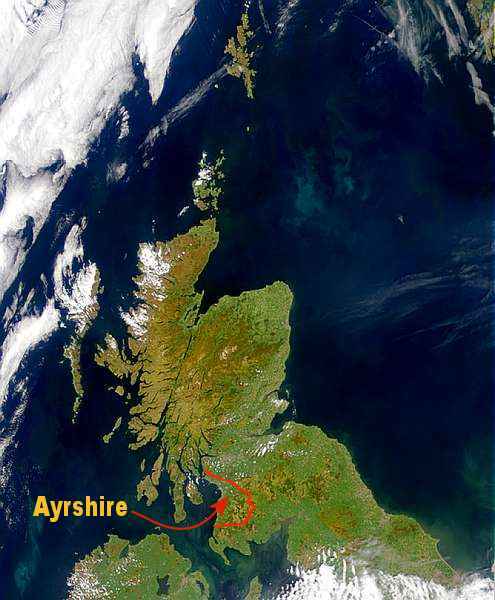 Click for a Map of the county and a Photo of Ayrshire from space by the OrbView-2 satellite. 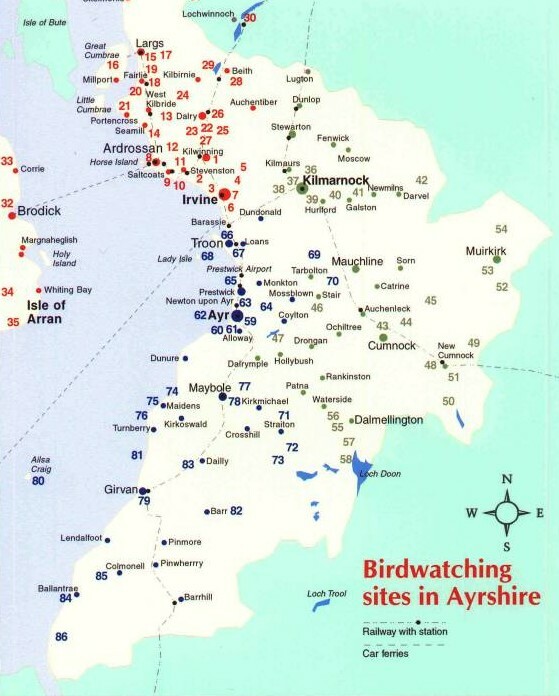 The map also shows the locations covered in the Birdwatching in Ayrshire and Arran guide. Click here for a species list of the birds of Ayrshire, giving an indication of their current status in the county. We also have a comprehensive list of the best places to watch birds in Ayrshire.This gives information on location and access, the birds you can expect to see, the best times to go, and other useful information such as the nearest pub and cycle route. This ties in with the Birdwatching in Ayrshire and Arran guide published in Spring 2003. Ayrshire Bird Report: the annual report on all the birding activity in the county based on records submitted to the County Recorder. 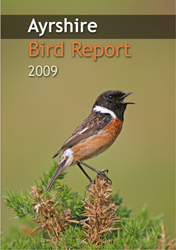 A comprehensive gazetteer of birding locations mentioned in the Ayrshire Bird Report is also available. Birdwatching in Ayrshire and Arran is a free, 28-page A5 booklet published by the Ayrshire SOC describing the best places to watch birds in the County. Local birding news is distributed via an email grapevine. This is a forum for announcing bird sightings (rare, unusual or just of interest) and events about birding in Ayrshire. To join, simply visit groups.yahoo.com/group/ayrshirebirding and follow the simple instructions. It doesn’t cost you anything and helps everyone keep in touch. Details of their meetings are covered in the Clubs and Events pages. This web site is hosted through generous funding by the Ayrshire Branch of the SOC.